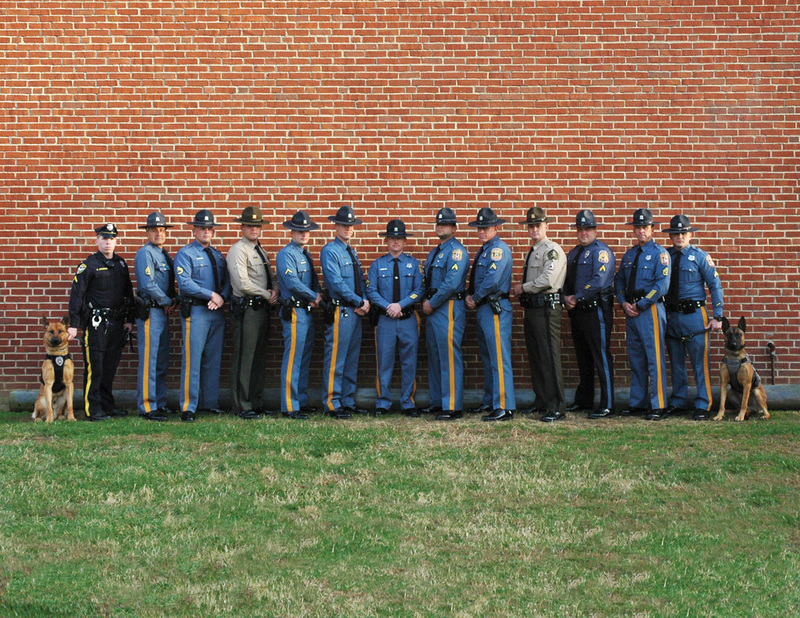 The graduates from the Delaware State Police Canine Training Unit pose for a photo after graduating from the 2018 Fall Patrol Certification and the Fall Narcotics Certification classes. The Delaware State Police Canine Training Unit this week held a graduation ceremony for the 2018 Fall Patrol Certification Class and the Fall Narcotics Certification Class. Their work paid off, with 11 teams successfully completing three months of intense training with new K9s. During the ceremony, Col. Nathaniel McQueen Jr. recognized the graduating teams, led by K9 handlers MCpls. Lenny Aguilar and Jeffrey Miller, for their commitment and dedication. The ceremony took place on Wednesday, Dec. 5, at the Delaware State Police Training Academy and included multiple agencies throughout the state. The graduating class consisted of 11 new K9 teams comprising seven Delaware State Police teams, one Newark Police Department team, two Delaware Department of Natural Resources & Environmental Control teams, and one Laurel Police Department team. The ceremony celebrated and recognized the successful completion of 12 to 14 weeks of various training methods, including; obedience, confidence course, tracking, building searches, areas searches, suspect apprehension and officer protection. In addition to the requirements set by the Delaware State Police Canine Unit, all the teams were trained to meet the standards of the National Police Canine Association. Four of the K9 teams were cross-trained in narcotics detection and are now dual-purpose patrol and narcotics detection teams. • Fall Patrol Certification Class: Cpl. Derek Balaguer and K9 Stryker–Troop 2; Tfc. Andrew Osgood and K9 Scar–Troop 3; Cpl./2 Matt Sammons and K9 Poncho–Troop 5; Cpl. Mike Fezza and K9 Drax–Troop 7; Cpl. Trevor Ditmore and K9 Leo–DNREC; Cpl./2 John Lister and K9 Vos–DNREC; and Pfc. Corey Spencer and K9 Luto–Newark PD. • Fall Narcotics Certification Class: Cpl. Pete Irwin and K9 Chico–Troop 1; Cpl. Ben Nefosky and K9 Mako–Troop 1; Cpl./1 Nick Ronzo and K9 Bane–Troop 2 GTF; and Cpl. Jared Haddock and K9 Grimm–Laurel PD.